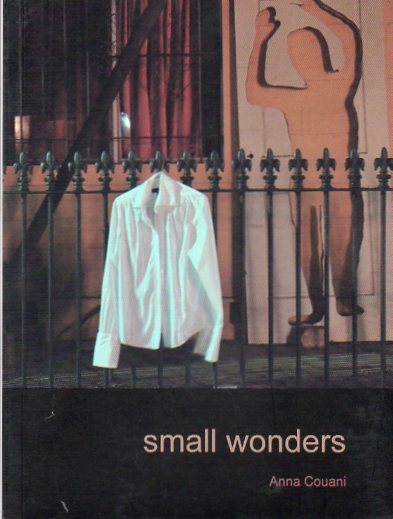 Small Wonders by Anna Couani 2011, Flying Islands Books, ASM Books & Cerebus Press. Some time ago I was staring through a microscope at a sample of seawater from the Great Barrier Reef. Affixed to the slide, long thin active strands of streaming protoplasm explored this barren and flattened landscape, groping for detritus, microscopic signposts. This new landscape is foreign, less than a millimeter deep and blasted from beneath by a white light as hot as a drowned sun. Tracking the strands, I found their origin, an individual amoeba reaching out from inside an elaborately sculpted shell, hundreds of body-lengths away from the tips of these exploratory strands, called poetically pseudopodia or ‘false feet’. The maligned outsider scientist Sheldrake argues that ‘the sense of being stared at’ is real, and the extended mind behaves like pseudopodia. Not only does light enter our eyes or other senses, but the mind reaches out through them, touching that which is distant, drawing together those objects, people, landscapes, even memories it has explored, generating a vast synthesis, a view of the world that centers on a unique space-time address and connects web-like to all it has touched. The poems in this book are like that. From the centre of a web of extended mind the poems reach out, like protoplasmic strands, across time and space, touching simultaneously the near and the far, Kochi in India, the arms stretched towards Turkey, between lovers-to-be who stare out at the same eye level from different Sydney buildings, protoplasmic strands delicately touching the past, the personal, familial, political, macroscopic or microscopic, probing the relationship between surfaces, the interior, the exterior, the individual and the collective, between whole cities and the minutia of urban landscapes, extending between cultures, lovers, philosophies, art movements. Anna Couani writes like no-one else. The poems together form a micro-novel in a pocket format, an organismic structure that can be understood at the level of an individual poem, yet at another level achieves its own coherence, as an organism contains its cells, tissues and organs, and is more than the sum of those parts, themselves wholes. Understood, as our memories constantly reform the networks, the non-linear narratives of our lives. Anna Couani’s intensely observational writing, her microscope or telescope eye, gives us the perspective of life as it is lived daily outside the enclosure, outside that morass of mass culture and homogenised values, beyond the gated elites of white-anglo Australiana and gendered clubism. When the future seeks to know what it was like to be outside the mainstream, an artist, writer, teacher, feminist, left wing, or perhaps unclassifiable, what were the details of daily life, upon what did the inner eye reflect through the seventies and into the present, Anna Couani’s writing will take us there. As academic Anne Brewster wrote; “Her experimental fiction, I argue, in its efforts to defamiliarise reading conventions, articulates a crisis of belonging. In its radical poetics of the gendered everyday it seeks to locate the body in the alternative communities which characterise minority constituencies” (Anne Brewster. ‘The radical poetics of the gendered urban quotidian: reading Anna Couani’s literary experimentalism of the 1970s and 1980s’. In: Mycak, Sonia, and Amit Sarwal, eds. Australian Made: A Multicultural Reader. Sydney: Sydney University Press, 2010. p46). Small wonders is the sixth of Anna Couani’s experimental prose and poetry works. She is well known as a writer who is not a member of literary clubs, eschewing conventional forms and the self-congratulatory camaraderie of insiders. Neurobiologist V. S Ramachandran commented in his recent book The Tell-Tale Brain “Homogeneity breeds weakness: theoretical blind spots, stale paradigms, an echo-chamber mentality, and cults of personality (p.xix)”. It is against such homogeneity, monocultural, gendered, and conformist, that Anna Couani’s writing is an effective antidote. If by kitsch we mean the enforced conformity of a homogenised establishment, the sentimental celebration of its icons, rituals, conventions, the denial and active cover-up of its negative and depressing realities, then Anna Couani’s writing is anti-kitsch. …what do you think about the new development? seems okay, really, I quite like it. whilst it’s being built. yeah. bad for the people who have to move out. Anna Couani has been exploring concepts of the sublime, not so much the idea of beauty in nature as it is sought by tourists, where the sun breaks through clouds over a mountain in an intimation of the divine, but those moments of incomprehension or shock that jolt, disturb or discombobulate us, when something darker emerges, something we might call the negative sublime. Yet the poems do precisely this, in their disavowal of kitsch concepts of beauty, the sublime splits apart to reveal its innards. In the poem ‘translation’, dedicated to Sou Vai Keng, light and dark juxtaposed produce a chiaroscuro of childhood images, freedom and safety versus the nightmare. The schoolgirl, in navy blue and white dress, with straw hat, ‘independent and brave’, walks over the black and white tiles, through ‘pre-casino Macau’, traversing a beautiful cityscape, but then a dark tail arises to slash in the night, demonic and impersonal, a grinning visage, fiasco without humour, planting its hooks. Colour, art, is the only escape. but then the façade is peeled back like an adhesive plaster. ……Is childhood magical? What is the temperature of the sublime?.. I met people who understood why you’d want to rail against the parochialism of your peers. As an object the book has a great feel. Pocket-sized, its waxy cover photograph by Anna Couani is itself a poem that echoes the atmosphere of the poems within. The exterior of the writer’s home is part of the streetwise streetscape of Hilik Mirankar’s Queen St Gallery (Glebe). As with most houses in the street, the iron spines of the fence enclose a sculpture by Hilik Mirankar, this one of a figure with overarching raised arms, bursting Magritte-like through a door. The negative space of the figure forms a shadow, an apparition through which we glimpse a wall of Sydney sandstone, whilst in the foreground a shirt impaled on a fence is a remnant of Hilik Mirankar’s streetscape exhibition, where many such fluttering disembodied shirts hung from the iron spines that fence in terrace houses. Within, the text is echoed by Debbie Sou Vai Keng’s evocative ink drawings, where trees like knives impale the clouds, a string of birds rise like sparks from some dark pool, reeds slash the face of the sun. Small wonders indeed. Sou Vai Keng is also the translator, into Chinese characters, of the poetry. Interesting visual structures emerge sculpturally from the complex ancient and newer logographs, and sometimes Greek, English, or computer-speak words leap out, as when the words Skype, Couani, Κουανης, and Skype again spring forward from the translation of ‘skype window’, creating meta-meaning that is both visual and poetic. Anna Couani met Sou Vai Keng when the latter translated some of her poetry for the anthology ‘Wombats of Bundanon’, produced by ASM Books. At Bundanon, the two discovered certain resonances between their lives as writers, artists and teachers, meeting again in Hong Kong and Macau. The poem ‘translation’ was written for Sou Vai Keng, as Anna Couani says, “…using her life partly and enmeshing it in my past as well. So the book is the result of a kind of dialogue between her and me, as well as connecting with Hilik Mirankar and his work in the street”. Small wonders is a fractal compression of connections. For information on the availability of small wonders contact ASM at KitKelen@gmail.com. This entry was posted in Anna Couani, Flying Island Books, Issue 8, Virginia Shepherd and tagged Australian Literature, Australian poetry by Mark Roberts. Bookmark the permalink.